Do any of you remember how much I loved Captured By A Rogue Lord?? Cause I totally did! It made me fall in love with Katharine Ashe's writing! So when I saw How To Be A Proper Lady would be about the long lost sister of the heroine in Captured By A Rogue Lord, I went LET ME HAVE IT!!! And I'm happy to report to you all that it definitely did not disappoint. AT ALL. 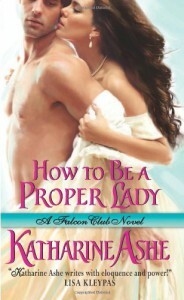 As in Captured By A Rogue Lord, the characters in How To Be A Proper Lady were wonderful! They're all very well developed and it's just the sort of cast of characters that make me an extremely happy reader! There were those I could love, those I could be annoyed with and some that just made me roll me eyes in a GOOD way! Like I would at a friend who's being silly. I really liked Viola, she's a strong woman and not just in the sense that I think she could hold her own in a fight. She's a good person and I loved seeing her struggle to figure out where she belonged and with who. And guys, Jin... He's just such a perfect hero. He's flawed and a little broken inside and HOT! And he's honorable and extremely loyal to his friends. Also, he's just the right amount of dangerous. But mostly, he just made me swoon and fall in love with him, which is what I want when I read a romance novel! But mostly, THE TENSION! OMG, it was SO GOOD! I think the first time I had tears in my eyes was before I was even halfway through the book and it didn't stop after that! There were so many stomach-clenchingly good moments that I found myself going over all those wonderful moments a second and sometimes a third time to absorb it all and feel ALL the feelings again! There were MISUNDERSTANDINGS that actually worked and show how easy it can be to get these things wrong but luckily for them, in romance novels there are pretty much always second chances. Or third. So they can figure it out and make me cry in the process. Which leads to me putting Katharine Ashe firmly on the 'must-read-ALL-her-books' list because after adoring 2 of her novels she deserves a place there. Her writing is very engaging and I fell in love with the characters and she had me feel ALL THE THINGS and I love it when a book makes me cry! STRONGLY recommended for anyone who likes historical romance!